Askinosie won silver at the Academy of Chocolate awards with this bar and I think that most would agree that it was well deserved. 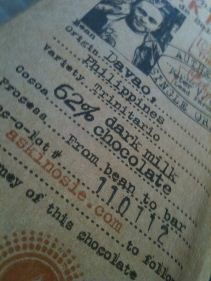 This dark milk chocolate bar is made with cocoa beans from Davao, Philippines and contains 62% cocoa liquor. They add organic sugar, goat’s milk powder and a touch of Fleur de Sel sea salt to create something unique. I love Askinosie chocolate. They work *directly* with farmers and while they are doing small batches compared to Green & Blacks, they are buying a *lot* of beans from the farms direct and that means a better life for the farmers and their staff. This is miles better and way beyond fair trade – this is better than just giving farmers a slightly better price for their beans – this is giving farmers a lot more money for their beans. And the Philippines – who else is making this much stuff from cocoa from the Philippines? They do a chocolate/hazelnut spread, a few bars and more. On the website, they have listed the tasting notes as petal, almond, hints of vanilla, creme brulee, caramel, mellow, toasted oats with a salty finish. I got creamy milk and a slight hint of what might be over roasted beans but could be toasted oats or maybe toasted oats and toasted almonds. I doubt anyone else would get that though as they would be caught up in the delicious chocolaty flavour with the unique creamy flavour. 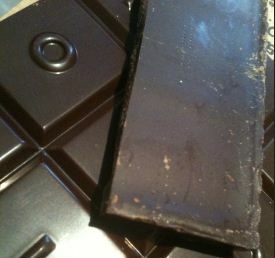 It is a very different bar and one that I think is going to convert people from milk chocolate to dark chocolate. By adding less sugar to the bar it is a healthier milk chocolate. By using goats milk it is safe for lots more people to eat. By making it with ethical chocolate it simply makes it the only milk chocolate you should be buying. So go off, buy a dozen bars and keep this one in your hand bag, briefcase, desk drawer, etc. and make it your milk chocolate bar of choice! Okay, that bar sounds absolutely faulous. I took a chocolate class awhile ago and discovered how much I did not know about chocolate and how fascinating the development and history is. Thanks, I will have to check this out! Askinosie are really worth the effort in finding and buying. The chocolate has kept its character and the work they do with the beans and farmers is outstanding!